My studio tour theme this Thanksgiving weekend will be "A Pastel Journey"
with examples, displays and demonstrations by me showing the differences between pastels & oils. We have brochures with maps to all studios on the free, self-guided tour in the gallery. in person ​before they're gone! 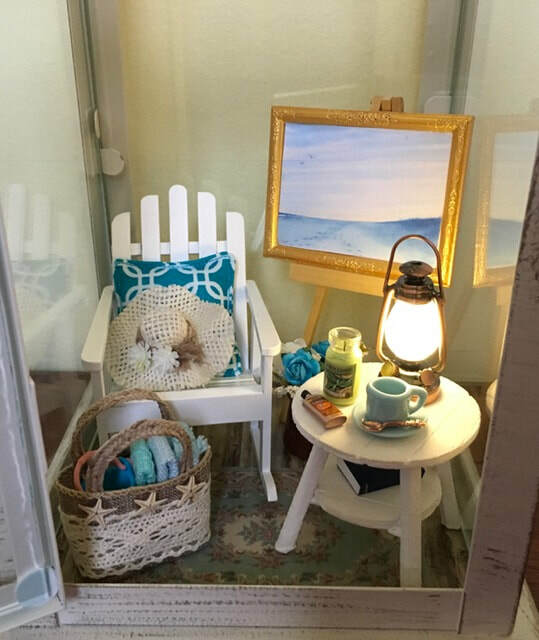 The Ann Cooper 'Summer at the Beach' miniature collection of one-of-a-kind lanterns containing beach cottage scenes including local elements and my paintings in miniature debuted Saturday, June 2, at my gallery in Ocean View. The collection is quintessential Ann Cooper – intricately detailed, warm, beautiful little worlds, like tiny, contained dollhouses that make you want to shrink and go inside and sit in your porch rocker or in your comfy chair by the fireplace and loose yourself in her world. I think once again they’ll sell out quickly, maybe even more so given the theme so many love. Each includes a special lighted feature such as a nautical lamp, flickering candles on the mantel, a chandelier or a chairside lamp and baskets of coastal flowers and bottles of locally “found” treasures from the beach. My paintings have a special functional art light at the top of them, just as they would in a home, whether on an easel or above the fireplace. ​Shown above, one of the lantern scenes Ann designed around my painting Never Alone. 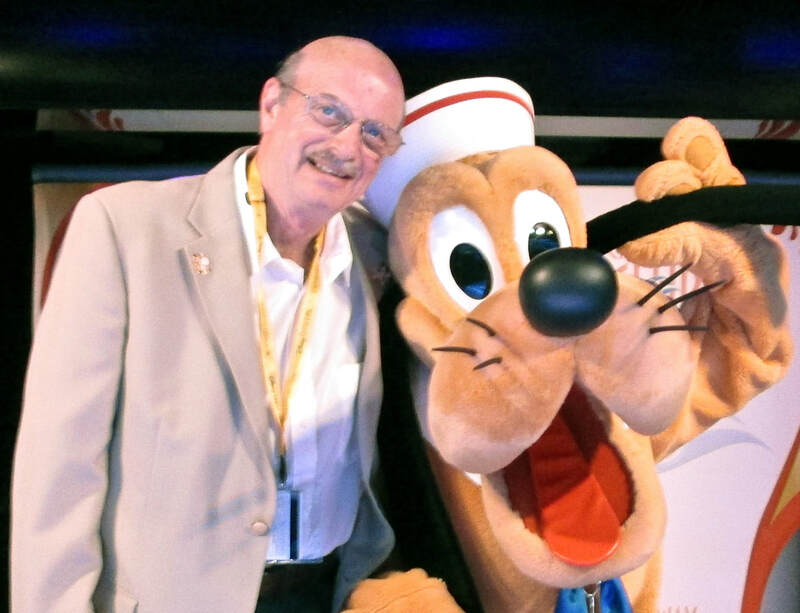 To be an expert at all things Disney you have to pal around with members of "The Fab Five." On Saturday, May 19, Disney-certified Glass Slipper Concierge travel advisor and Orlando Travel Expert Duane Whitman shared the latest news that will affect vacationers at Walt Disney World and on the Disney Cruise Line this year, including the upcoming openings of Toy Story Land and Star Wars Land. Celebrating decades of Disney travel planning and six years as an award-winning travel advisor and agent with Glass Slipper Concierge, one of the most award-winning Disney-centric travel agencies in the world, his talk focused primarily on the new 11-acre Toy Story Land opening in June with early information about the 20-plus acre Star Wars Land opening in 2019. If you missed it, but would like some help with your family's next Disney vacation, call Duane at 302-448-1534 or stop in the gallery where he volunteers as manager. We are now open Every Day. Hours: 10 a.m. to 5 p.m. Monday through Saturday, 10 a.m. to 4 p.m. Sundays. A service we provide - Try Ellen's paintings on your walls, virtually. Send us an image of where you want a painting and we'll send the image back with your selection of paintings on your walls. It's a great tool and we're glad to help. ​Best times to visit the gallery - All open hours are good now. Traffic on the now 3-lane Rt. 26 moves smoothly even in the summer, slowing only during peak tourist arrival and departure times. Make sure to slow down as you approach the gallery. The driveway entrance comes up very fast. Free parking surrounds the gallery, but the parking lot entrance comes up fast so please slow down as you near it. Scan the QR code on this page for live mobile directions. Like my gallery's page on Facebook for check-ins during other hours. For a personal appointment contact me. New artisans' hand made wares are being added to this website almost daily to make your tax-free shopping easier, while supporting local and regional artists. Check them out in the drop down menu under American Handmade at the top of this page.